Families that spend time together feel a strong connection to one another. Throughout the day, everyone lived separate lives disconnected from one another. Your time together allows for everyone to regroup and process your experiences in a healthy environment. During family time our children listen to the words we use and are expanding their vocabulary. They are learning social cues on when they can speak and when to be patient and listen. Remember--we don’t teach our children manners by telling them what to do or not do, we teach them manners by modeling appropriate behavior in and outside of the home. The structure and consistent rhythm of sitting down for family time creates security in the hearts of our children. Studies show that children provided with a stable foundation are more confident and better equipped to fight off depression and anxiety. It has also proven to increase grades at school—seriously. Family time is the perfect setting for starting conversations, but how do we actually start those conversations? What questions do we ask that will get us past “How was school?” and those dreaded one-word answers? In our research, we couldn’t find a good collection of questions that we could consistently go back to and use. That was the inspiration behind our book 365 Connecting Questions for Families. What follows are the questions that we have been testing on our children in attempt to strengthen the core of our family and raise better humans. As a result, we have seen more love, more security, stronger connection, and experienced more honest conversation during family time. 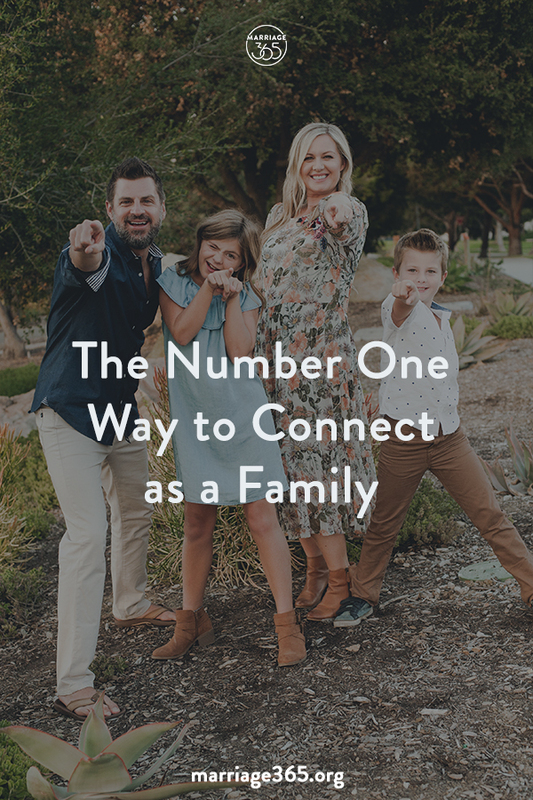 The number one way to build emotional connection with our family is to ask open-ended questions. In the answer, we discover other’s dreams, desires, preferences, values, fears, and perspectives. This is true for marriage and even more so in parenting. Any parent seeking to create stronger bonds of trust, respect, and love, has to actively engage their children in this. But there is so much more that we communicate when we ask a question. Asking open-ended questions shows that we are listening. There is so much noise coming at our children these days between school, social media, and video games, that they need space to process the complex world of emotions raging inside of them. Having a safe place to share their feelings is a great way to show how much we love our children. Modeling listening skills helps our children understand empathy in our self-absorbed, screen-centered world. Think about a time when you felt happy. What was going on and who were you with? Are you being the best friend you can be to those who care about you? What are some things you can work on to be an even better friend? Should you give money to a homeless person on the street? Why or why not? Many men and women from all around the world volunteer themselves to serve in their country’s military. What do you think they hope to accomplish by serving their country? Why do you think they make such a big decision? If you could be a photographer for a day, what would you take pictures of? Who in our family is the most organized? Why do you think this person is organized? Do you think kids should get their own cell phone based off of their age or by how responsible they are? Explain. Looking for more questions to connect with your children? Our book will help your kids share what’s on their mind!